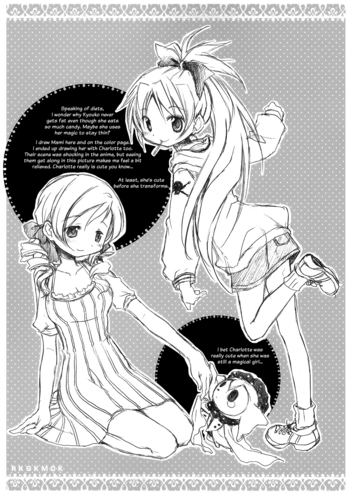 Official Mami and Kyouko manga Art. Splash art from the official Mahou Shoujo Madoka Magica manga.. HD Wallpaper and background images in the Mahou Shoujo Madoka Magica club tagged: kyouko mami mami tomoe kyouko sakura mahou shoujo madoka magica splash art hanokage manga. This Mahou Shoujo Madoka Magica photo contains anime, truyện tranh, phim hoạt hình, and manga.